Sunday was the first day of the Chinese New Year and it got me thinking about visits to a couple of Chinatowns last year. While in Portland Oregon's Chinatown last October 2, We studied an exhibit at the Portland Classical Chinese Garden concerning the Chinese New Year celebration. 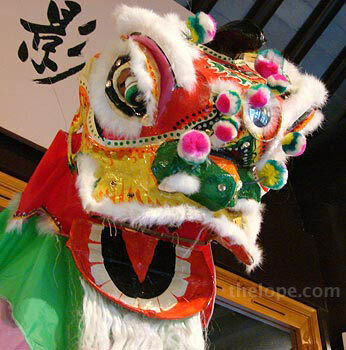 Chinese New Year was the most important holiday of the year for Chinese families and represented a starting-over. Houses were cleaned, new clothes were bought, debts were paid off, people got fresh haircuts...that sort of thing. 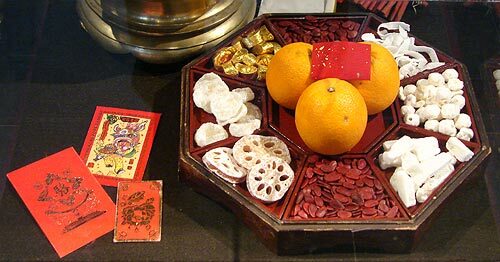 The colors red and gold were thought to attract prosperity and children were given money in small red envelopes, as seen at left. I bet that explains the red and gold decor in Chinese restaurants. Special holiday foods were also served, including chickens with the heads and feet still intact. I suppose such a fowl would not have made a very archival display, so instead we see a tray of traditional treats. Most children of Portland's Chinese families throughout the 1950s attended not only the mainstream public schools but also studied the Cantonese language at the Chinese Consolidated Benevolent Association Language School. Of course, there were the celebrations. Firecrackers were used, ostensibly to ward off evil spirits and men and boys performed Kung Fu in streets. 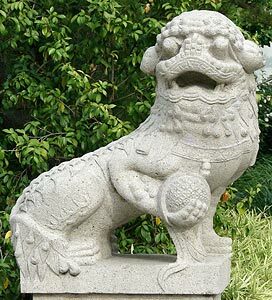 I saw no references to parades, but the exhibit did mention "the lion dance" and showed a photo dated 1937 of two men in a costume with a head like the one on this statue. Apparently, shopkeepers fed the "lion" lettuce leaves and money in an attempt to bring prosperity. 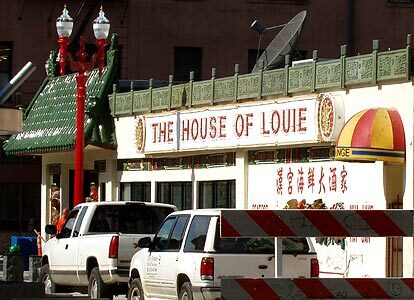 Portland's Chinatown has the sorts of businesses you'd expect - gift shops and restaurants like the House of Louie Restaurant, 331 N.W. 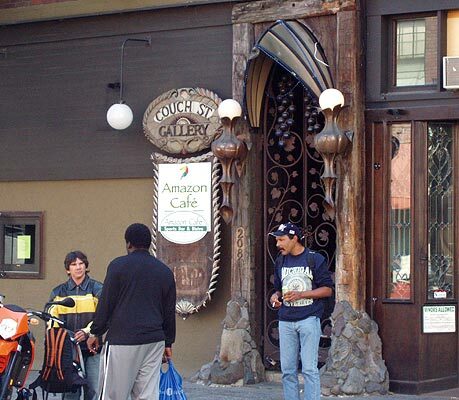 Davis Street, which occupies a 1922 vintage building, according to a Portland tourism website. However, back out in the streets, despite the cool red and gold street lights (red and gold = prosperity, remember? ), it is apparent that Chinatown is not very...well, not very Chinese. Sure there are plenty of storefronts with Chinese characters...but there were few Chinese people around. The neighborhood seems more like a ghost of a Chinatown, hanging onto the reputation despite being dotted with businesses like the Couch Street Gallery. I did like the gallery's entrance, though. 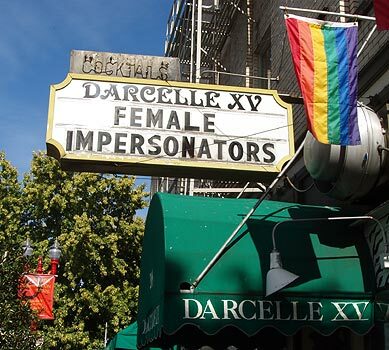 My image of a Chinatown doesn't usually include a bar with female impersonators as entertainment, but Darcelle's XV has been here since 1967 so what do I know? 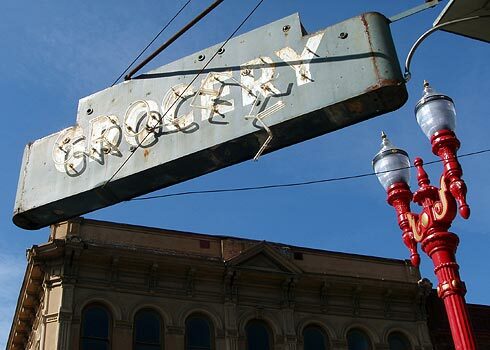 Of course, I was largely doing what I always do - walking the streets shooting pictures of signs. 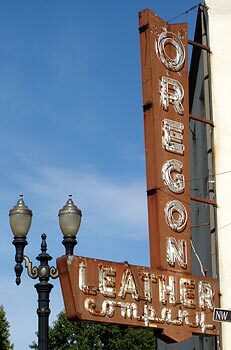 The borders of Chinatown vary according to which source you are reading, but the Oregon Leather Company, despite not being near those cool red street lights, is often listed as being in Chinatown. It gets good marks from a comment in a section of the Portland Travel Guide, which is otherwise somewhat critical of Chinatown. I should mention that I missed a few good signs; I only walked NW 3rd street since I was on my way to a specific destination, but I've seen nice pictures of a huge entry gate and a good restaurant sign over on NW 4th Street. Most of the sources I read considered the north-east border of Chinatown to be Union Station at 800 NW Sixth Avenue; this is the top of its 150-ft clock tower. 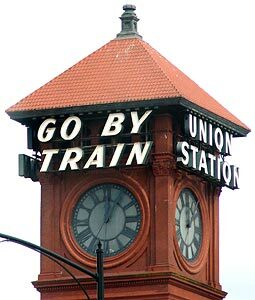 The station was built from 1890-1896 by the Northern Pacific Terminal Company and the neon "Go By Train" signage at top was added after WWII. Of course populations shift and Chinatown is no exception. In fact, part of the area was once Japantown. After Pearl Harbor, that changed in a predictable, if not palatable way. Japanese Americans were forced to sell out and were sent to interment camps. 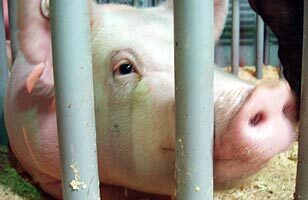 It was not, of course, a fair deal financially for them. The property they left behind was largely occupied by Chinese from adjacent areas, and so the present Chinatown took form. 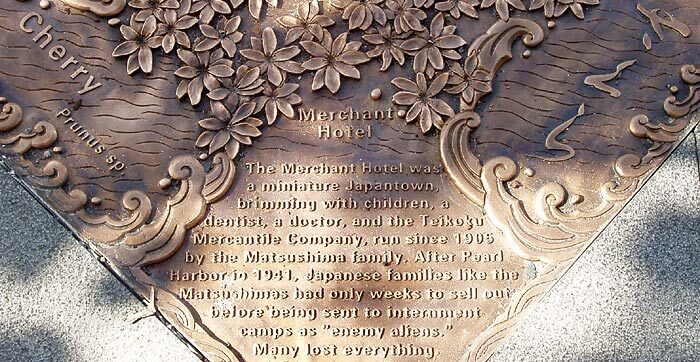 This plaque implanted in a sidewalk offers information on The Merchant Hotel, a previous stronghold of Japanese Americans. Chinese have left Chinatown in a less tragic way, but have largely left, nevertheless. According to wikipedia, another area in Portland has sprung up as a popular area for Chinese. Other sources indicate the ancestrally Chinese population has simply mainstreamed, diffusing into the suburbs like everyone else. In that respect, I suppose the loss of an area of concentrated cultural identity is a good trade, if the people who once lived there have achieved the dream of prosperity hoped for by their ancestors. Maybe red and gold are good colors? So who lives there, if not Chinese? For quite some time, Chinatown has been known as a haven (or dumping ground, depending on your perspective) for the down-and-out. 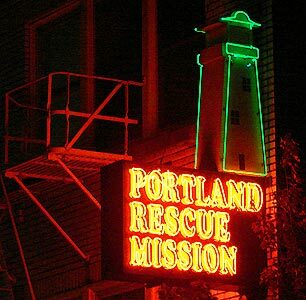 Several large social service agencies, such as the Portland Rescue Mission, have facilities here, and in the adjacent Old Town district. 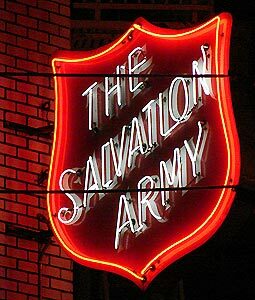 A January 11, 2007 article in the (Portland) The Oregonian explains the predominance of social organizations in Chinatown and nearby parts of Old Town. Many of the former hotels in this area are now low-income housing. 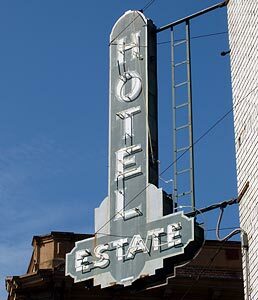 A May 2005 article in the (Portland) Daily Journal of Commerce about the Estate Hotel mentions that the 100-plus year old building was to be expanded for that purpose. 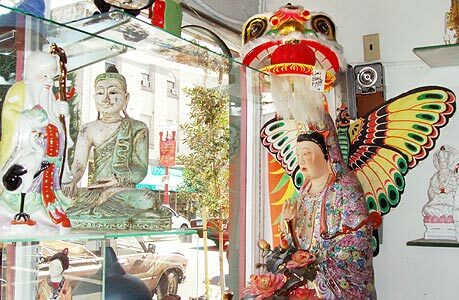 My two greatest fun spots in Portland's Chinatown were the Portland Classical Chinese Garden, which I'll post more pictures of later, and a Great Era Oriental Imports, where shopkeepers helped Ace with a wardrobe challenge. 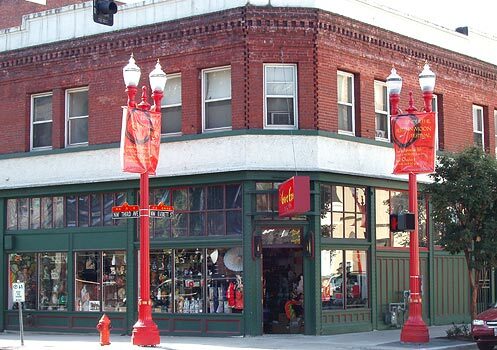 Great Era is housed in the Pallay Building, 239 NW 3rd Avenue, a 1908 building which is listed as a National Historic Landmark. It had all the stuff you'd expect - Chinese gifts a-plenty, which was refreshing after the un-Chineseness of the area. There also seemed to be things relating to Japan and other Asian cultures. 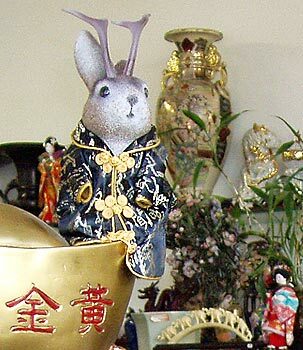 As valet for Ace Jackalope, it's my job to come up with many of his disguises; I didn't have anything remotely Chinese, however, and needed something for the Chinese gardens across the street. I found it at Great Era, in the form of a six-dollar wine bottle cover. Here I am helping Ace into the much-altered cover. 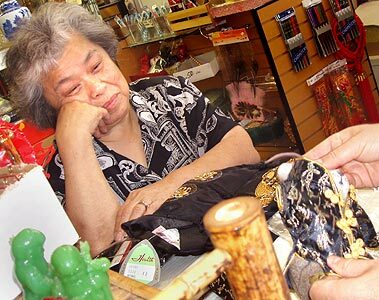 Shopkeeper JoAnne Hong looks on, patient if not perplexed, after furnishing me with the scissors and two kinds of tape needed to tailor the outfit. For that alone, I would like the lady. 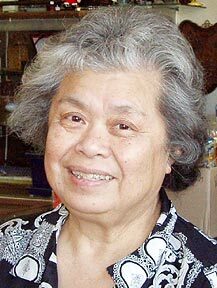 And in one of my post-visit, pre-blog google-fests, I found an interview with her as part of a June 10, 2005 story by Ben Jacklet in the Portland Tribune about the afore-mentioned balance between the cultural identity of Chinatown and its place as the district of social services. About the lack of Chinese in the area, Hong said: "You're in Chinatown...Can you roll a ball down this street and hit one single Chinese person?" When finished, I just had to pose JoAnn with her son, Dan and Ace in his finished disguise. The finished outfit - now we're ready to go over to the Chinese Gardens, and nobody will be able to tell Ace from a local resident...except maybe I should have thought about the fact that there are few Chinese here and disguised him as a tourist. Just three weeks after leaving Portland's Chinatown, I found myself in London's Chinatown on October 23rd. 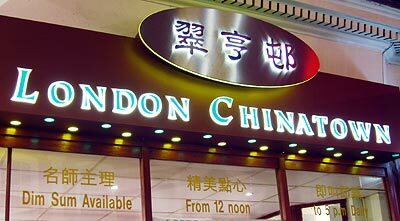 I was surprised to read that, according to Wikipedia, the present London Chinatown dates back only to the 1970s. Previously, a different area of London was known by that name. So much for my romanticized notions of trodding the same area in which Conan-Doyle's Sherlock Holmes lay disguised in opium dens. 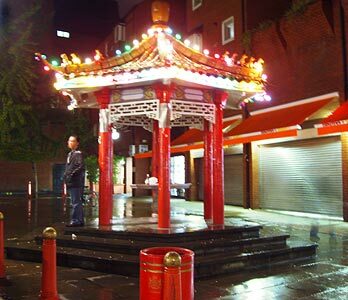 Apparently, before the present London Chinatown, just south of Soho and near the Palace Theatre on Shaftsbury Avenue, a different area of London was the Chinatown. walkin' through the streets of Soho in the rain. gonna get a big dish of beef chow mein." 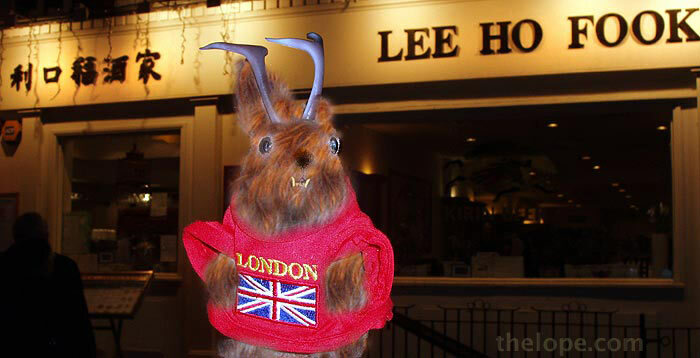 Le Hoo Fooks is on Gerrard Street, which Led Zeppelin fans may remember as the place where the band's first rehearsals were held. That was in 1968, before this area was Chinatown. Back then it would have been considered part of Soho, which may explain why Zevon mentions Lee Ho Fooks as being in Soho. Zevon published the song in 1978, when Chinatown would have been new and nebulous identity, if it existed on Gerrard Street at all. London's Chinatown parallels Portland's in that very few Chinese live there. This is not so much due to a migration as to the fact that the London area is commercial and not residential. 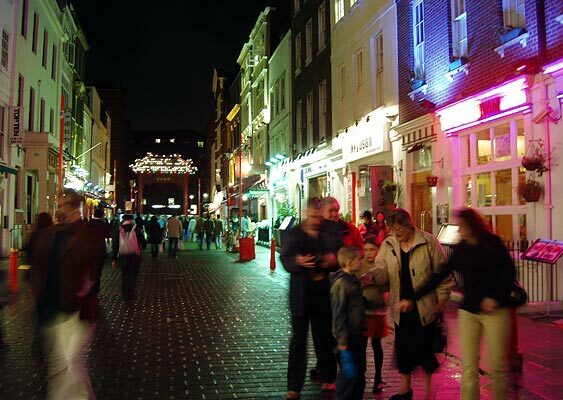 London's Chinatown is also slated for a planned commercial development, which has undergone criticism for its potential to dilute the area's cultural identity. 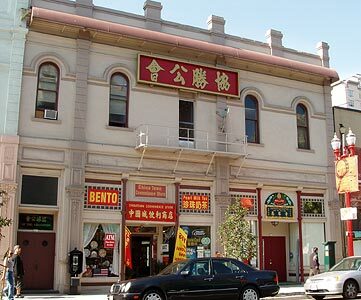 Although, since the area has only been "Chinese" since the 1970s and has few residents, It doesn't personally impress me as having a cultural identity so much as a commercial one. 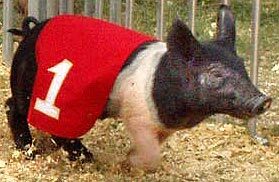 One final note on Chinese New Year: despite the year being named for them, I've not heard that pigs are going to be accorded any special privileges this year. Your posts are always informative. They take us places we haven't been before. 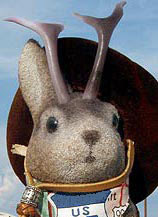 I would be happy with the cleverness of showing the bunny in different outfits, but the insights and the thoroughness of the research add a depth to the blog. I just hope nobody mistook Ace for a bottle of wine and tried to drink him.